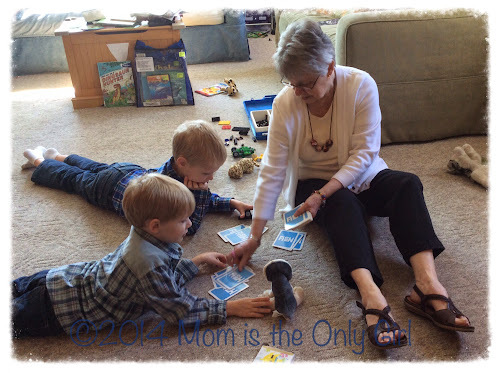 Gramma’s visits always give us several opportunities to play games. On this occasion, Sweet Pea pulled out Fish, a cute card set with pictures of fish which you can either play Memory or Go Fish with. the Twist…Sweet Pea made up his own rules to Go Fish! His rules included everyone getting the number of cards that matched their age (except for Gramma, because there weren’t enough cards!) Play goes from youngest to oldest and the youngest plays with all his cards showing. After a few minutes the boys decided to play according to the proper rules and they still had fun! I know we should teach our kids to follow rules, but I think there is room for discovery and exploration if we give a little wiggle room. I love watching how things turn out when the rules are altered. Many times it results in trial and error, other times not so much. One thing that often times results is a lot of fun experiencing something new! What would happen if we changed the rules to other games? Hmmm…give it a try and see! Links to a post or use of a single image with a brief description as long as you link back to the original post are permitted. Republishing posts in their entirety or using images without links is prohibited without permission. Please respect my work! Adult supervision is always recommended for every project and activity featured on this blog. Please read the instructions for each activity thoroughly before deciding whether is is appropriate for your child(ren). Mom is the Only Girl is not responsible for any injury or damage while replicating activities or experiments from this blog.